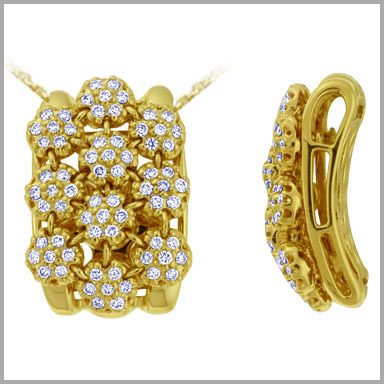 This enchanting pendant is crafted in polished 14K white or yellow gold. It features 70 full round cut diamonds in prong settings making up scintillating blooms of savvy shine. The total diamond weight is approximately 0.77ct with a color of G-H and a clarity of SI. It measures 7/8" x 9/16" and includes an 18" cable chain. This pendant works well with many of Sonia's designs that I own...I don't know the gold weight but it is quite heavy. The diamonds are very high quality and sparkle as only Sonia's diamonds do. If this design intrigues you as it did me...order it as you will not be disappointed. A very different and very classy design....As always Sonia, thank you for bringing us ladies such wonderful jewelry and using top notch diamonds that never fail to sparkle indoors as well as in the sunlight!